After four seasons, Castle and Beckett finally made the leap. The big question on ABC’s Castle becomes: What happens now? When viewers last left the novelist (Nathan Fillion) and detective (Stana Katic), the two abandoned the “will they/won’t they” query that had been hovering over them for the past four years and laid everything out — in bed. The Hollywood Reporter: The season premiere picks up right where after season four left off. Where do we see Castle and Beckett in the opening moments, and what can we expect? 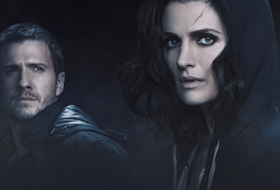 Stana Katic: Season five starts off a couple of hours after season four ended. It’s exciting because it’s the first few moments of Castle and Beckett together, in a way. It’s the aftermath of all of the wonderful things that have happened. Does this mean it’s something real and how do they navigate through that? Of course, the kingpin behind Beckett’s mother’s murder is still at large, and that isn’t locked up at the end of season four. We come one huge step forward on that story line, and hopefully there is more resolution for the audience. There’s definitely a big payoff. THR: What obstacles will Castle and Beckett, who has resigned from the police department, be facing this season? 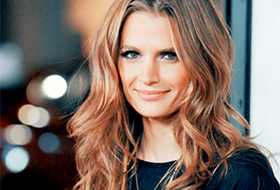 Katic: Every new relationship has obstacles. One of the wonderful things of two people getting together is them finding out how serious they are about each other, so that’s something these two characters will have to ride. Other people will come in and shake things up a bit. They also can’t go public with their relationship because they would risk not being able to work together anymore, and they obviously make a really great team. They’re not willing to compromise that, so they keep it a secret. But keeping things secret is nearly impossible when you work with a group of detectives. THR: How do their friends at the precinct deal with the pair’s new dynamic? Who is the first person who figures it out? Katic: At this point, everyone catches on that something’s a little different about Beckett, but nobody quite knows why. She’s always been a very private character, especially when there’s something at risk as big as losing Castle as a partner. I think she’s going to play things a little closer to the vest than she would normally want to, especially with a group of people in the precinct who she considers her family. Detectives Ryan (Seamus Deaver) and Esposito (Jon Huertas) are basically her work family. They all do a really great job of hiding [their relationship] from people they love; Castle less so, of course, because that’s just the reality of living at home with your mother and daughter. [Laughs] For Beckett, the risk is too big. THR: Do you foresee regrets that Beckett might encounter in regards to this new relationship or decisions that she might be making because of it? Katic: I don’t think her career will ever be affected. She’s a working girl; she knows how to compartmentalize and be efficient. The things that will come up are the normal. Castle was divorced twice; what happened to those relationships? Is he the kind of lover, boyfriend, whatever it is they end up defining it as — and we haven’t clearly defined it, necessarily — is he the kind of lover who stays true? Right now, we’re enjoying the new discoveries that new couples always have in the first couple of months and finding the neuroses that are common in a hidden, secret relationship. We’re in the honeymoon phase, and I’m sure [creator] Andrew Marlowe will be mixing it up soon enough. THR: Because nothing can ever be too perfect in the TV world. Katic: Nothing’s ever perfect, but these two characters are definitely meant for each other. THR: What’s the biggest question Beckett will be facing this season? Katic: A part of the growth is, as an audience, we’re going to discover what Beckett is like in a relationship. We haven’t really seen that side of her — the girl in Beckett, the one that doesn’t have to be the alpha female in the room leading the charge, solving crimes and being the authority figure. There’s another side to the character that we’ve only ever seen peripherally with her short-term romantic interests. It’s new territory for the writers; it’s new territory for the cast. THR: Is there a scene that you’ve shot recently that stands out for you in terms of significance? THR: Castle is known for its themed episodes, and fans particularly look forward to them each season. Is there an upcoming one that sticks out? Katic: There’s a Star Trek episode coming up. That’s probably the one that pops most off the mind. It’ll be coming up after episode five, probably seven or eight. THR: You also took on your inner rock star in the upcoming film CBGB. What was your experience filming that? Katic: My character is a producer and rocker in the club, and it’s based on a real woman, [Dead Boys producer] Genya Raven, who I got to meet in New York City. It’s a fun romp in punk rock and its history. I’m excited to see the whole thing, it’s a special piece and a part of music history.